Edraw SVG Software offers a set of vector drawing tools that can rival a professional illustration program, easy to create SVG. Are you searching a SVG software to create and edit SVG images? Are you using the Adobe Illustrator to draw icons step by step? Are you not great at drawing? Edraw Max is the best choice to create SVG and save you a lot of time. 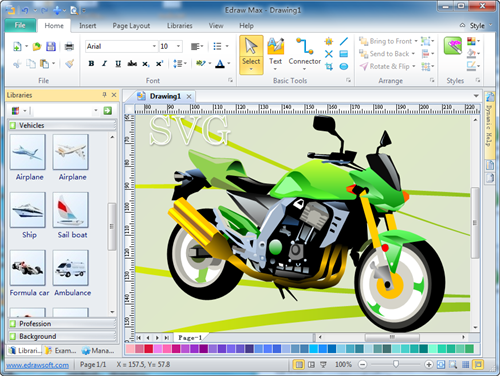 It features powerful vector tools, a standard set of basic shapes and a user-friendly and intuitive interface. Edraw SVG software offers a set of vector drawing tools that can rival a professional illustration program, which makes it easy to create SVG. Besides, with more than 8000 vector shapes, create SVG graphics couldn't be easier! The vector shapes are from a wide variety of business charts, clipart and presentations. Easy to Learn, Easy to Use. Drawing does not need to start anew. Just drag the ready-made shapes from the library pane and drop them on your page. Done. Drawing with Edraw is super easy. The following free vector shapes are parts of the clip arts in the symbol libraries. They are easy to export as SVG format directly. Edraw offers ready-made SVGs that support drag and drop use. This enpower people without drawing skills to create infographics easily. They are easily editable, separable and fully integratable with MS Office. It's easy to export the drawing to SVG format. 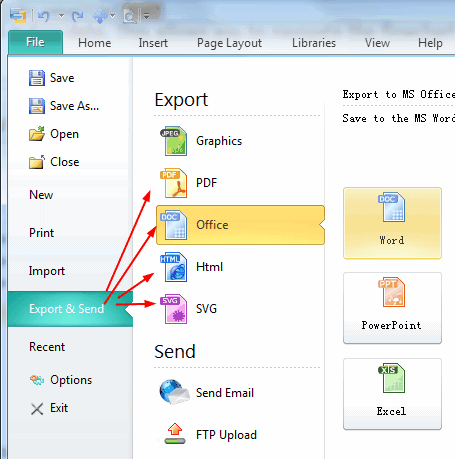 Only click the File menu, then click the SVG item in the Export & Send option. With Edraw, you can easily draw SVG vector graphics that can be scaled and printed at any resolution, without losing detail or clarity. Distinct colors, fonts, shapes, styles, pictures, text, and symbols are available for each path. SVG is a text-based graphics language based on XML format for describing two-dimensional vector graphics. SVG can present the vector graphic shapes such as paths consisting of straight lines and arc, raster images and text. Scalable Vector Graphics is an open standard language for describing two-dimensional graphics and graphical applications in XML developed by World Wide Web Consortium (W3C). The following sample SVG shows some drawings in Edraw software. Click these following icons to view the SVG example in the Internet Explore.